Learn about Lake Charles, Louisiana, by reading Southwestern Louisiana Knows How To Party! - Lake Charles, Louisiana by Sandy Zimmerman, Travel Writer. It features a mini, but thorough tour of the destination, plus all you'll need to know to plan your trip including getting there, objective information on places to stay and eat, and things to do. At the end of the article, we've provided a summary of the contact information for your easy reference. Enjoy! Even when it is not Mardi Gras time, visitors can experience a touch of the Mardi Gras excitement all year long in addition to the Cajun culture! I arrived in Lake Charles a few months before the Mardi Gras festivities began and was thrilled to stroll through the Mardi Gras Museum of Imperial Calcasieu to see a close-up view of their costumes and floats. I did not realize that Mardi Gras costumes were so jeweled, so dazzling, and the float scenes were so breathtaking! Most of these scenes and costumes on exhibit were open without being inside glass cases. Each scene is designed just as we would see them at the Mardi Gras. They house the largest display of Mardi Gras costumes in Louisiana, which were collected from 1963 to the present day. 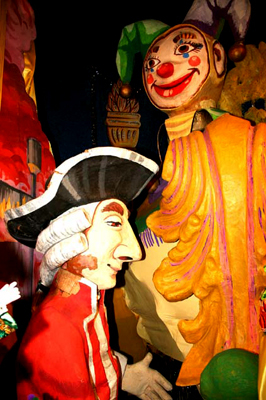 Carvings on the side of floats are just one of the things you will see at the Mardi Gras Museum. Every Krewe (organization) hosts parades, parties, and balls with different themes - Cruising the Caribbean, Gone with the Wind, Carnival in Venice, etc. Even though the royalty costumes cost from $3,000- $10,000 each, they are only worn once! These are magnificent pieces of art! Many people have Mardi Gras rooms in their homes to preserve their costumes. Krewe members pay for their own costumes and then throw beads and trinkets for the crowds. Imagine having to dance and walk in costumes weighing 60 or more pounds! When you stroll around the museum, you will understand how important Mardi Gras is to the people of Louisiana. 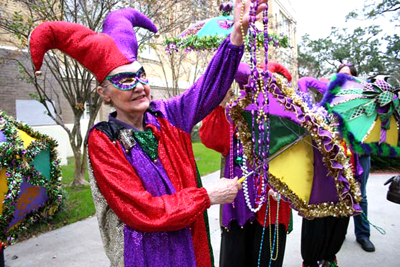 The Mardi Gras is more than a parade and parties, these traditions are part of their culture. The excitement of visiting Lake Charles, Louisiana is discovering their traditions! Backed by Mardi Gras music, the costumed Twelfth Night Revelers greeted us with colorful beads when we arrived. Our tour scheduled a demonstration of how to decorate a King Cake. We each were given a cake. I scattered several beads, sprinkles, toothpick flags, and icing around the cake. A small toy baby was hidden somewhere in the center. Getting involved and participating means so much to me! The owner gets up at 2-3 am to bake around 3,000-5,000 cakes for their 6-week Mardi Gras celebrations. There are a lot of parties. No two are alike. The origin of the King cake can be traced back to the middle ages. Driving along Lake Charles’ downtown Carpentier historic district after lunch, we saw a number of their 240 historic houses with all types of early architecture. The first French settlers arrived in the 1760s. Since there were no architects until the early 1900s, the buildings reflect the individual characteristics of the carpenters and builders. These carpenter architects got their plans from pattern books and were very creative in combining different elements and details. The oldest homes were built from 1865- 1885. The city is known for having “The Most Historic Homes in the South”. Pick up the self-guided walking or driving tour brochure to see the area and learn about these buildings. The Creole Nature Trail covers 180 mile walking and driving tour with visitor centers and diorama displays. Sabine National Wildlife Refuge includes a 1 ½-mile boardwalk, which offers an opportunity to meet alligators, ducks, and various types of marsh foliage up close and personal. Admission is free. You should not visit Lake Charles without experiencing one of their Cajun restaurant nightclubs! Dine on the taste of traditional Louisiana cuisine, enjoy their specially mixed spices, and dance to a Cajun beat! Our tour brought us to Big Daddy’s Restaurant. Rolls of paper towels sat on each table and a large sink was located on the wall of the dining room. When eating crawfish and shrimp, we usually have to remove the shells and eat with our hands. Usually they order a big 3-5 pound bowl or platter of crawfish for each person. Or try shrimp Creole, Jambalaya, Etouffee, gumbo (stew), Po Boy’s (sandwiches) and some other typical Cajun dishes. Big Daddy’s Restaurant offers live Cajun and Zydico bands at no cover, no minimum. One of the friendly waiters taught us the Cajun Two Step and Cajun Waltz so we could dance to Chris Miller’s 5-piece band. 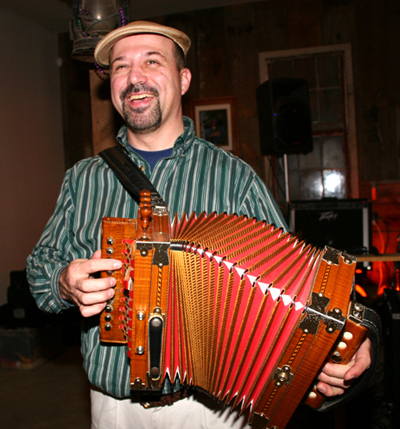 Chris explained, “We use our own Cajun accordion along with the fiddle, sax, and other instruments trying to push it all together and make a gumbo out of it”. The City of Lake Charles is located on Interstate 10 between Houston, Texas and New Orleans. It took us around 2-1/2 hours from the Houston airport to Lake Charles. Lake Charles also has their own airport. L’ Auberge du Lac Resort & Casino offers first class restaurants, Las Vegas-style casino action, a full service spa, entertainment, as well as 26,000 square feet of banquet and meetings facilities. The Seafood Palace Restaurant serves extra large 5 pound platters of crawfish as well as other Louisiana favorites. Within the Carpentier historic district, the quaint Pujo Street Restaurant is a part of the cities’ history. Originally built in the turn- of- the- century, 1898. They feature a fusion of different cultures with a Cajun and Southwestern flair. You can arrange a “Day with the Cajun’s” or “Mardi Gras” Tour anytime. Our tour of Southwestern Louisiana only took us 180 miles from Lake Charles to Eunice, St. Landry Parish, Lafayette, and New Orleans. But this short journey was so different, so immersed in Cajun culture that I felt we were given an insider’s view of their world! Southwest Louisiana is named the "Festival Capital" of Louisiana with over 75 annual festivals, there is something going on nearly every weekend. When you want a “real” look at Cajun Country, call the Southwestern Louisiana Convention & Visitors Bureau to provide free information, itineraries, and advice. Their phone number is 800-456-SWLA, or visit their web site, http://www.visitlakecharles.org/.